Search and seizure operations require professionalism and the ability to work efficiently in highly pressured and potentially adverse environments. For many legal matters, they are key to successfully securing and preserving vital evidence, and their success can be crucial in ensuring justice is served. CYFOR are specialists in the collection of data in such a manner and are best-placed to perform a forensic analysis, or facilitate online data review through our platform. Search and seizure is the legal term used to describe a procedure used in civil and common law legal systems, whereby law enforcement or authorities suspecting that a crime has been committed, commence a search of a person’s property and confiscate any relevant evidence found in connection to an investigation. Search and seizure orders are also known as search orders and were formally referred to as “Anton Piller” orders. The purpose of such an order is the prevention of the destruction of documentation or evidence by a defendant before a trial commences. Under what circumstances are they ordered? 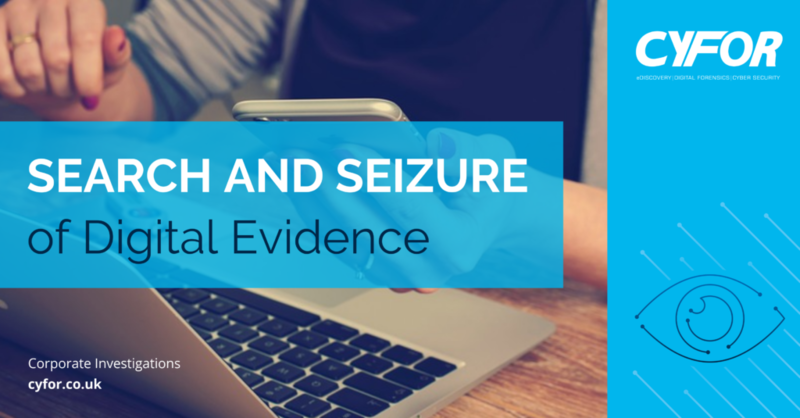 The purpose of a search and seizure order within a civil or corporate investigation is to preserve digital evidence or property which is (or may be) the subject of an action. Often, they are ordered when cooperation has not been received by a party, and are seen as a fairly extreme measure and in most cases a last resort. CYFOR recently executed the search and seizure of over 200 exhibits, in a co-ordinated operation involving 7 investigators across 5 locations for the duration of one week. The forensically collected data was then processed and hosted for online review by the relevant parties. In the Ukraine, during the 2014 period of civil unrest, CYFOR deployed 2 digital forensic investigators for a data collection, who remained on site for 28 consecutive days. This collection was part of an investigation into a highly publicised and well documented situation. During a period of heightened political instability in Georgia, a team of CYFOR investigators were operating onsite, close to gunfire taking place openly in the local streets nearby. Multiple CYFOR investigators operated as part of a cohesive operation across Europe, undertaking a forensic collection relating to proceedings in a £350M dispute between telecoms companies. The scope of collection was over 225 custodians throughout the UK and Europe. CYFOR were instructed for the search and seizure of digital evidence relating to 75 custodians, as part of a £50M dispute between a local government body and a construction firm. Members of the Saudi Arabian Royal family instructed us on an onsite collection in their country, having been involved in a litigation in the UK. Our team were under the direct supervision of security personnel and operated within the Royal Household. Once a search and seize order is issued, time is of the essence. CYFOR’s search and seizure team comprises of internationally experienced, security cleared digital forensic investigators. Adhering to the Association of Chief Police Officers (ACPO) Guidelines, all exhibits are retained in our forensic chain of custody with sealed evidence bags and listing forms. Our team provide a rapid response and efficient service, ensuring the extraction, preservation and analysis of evidence is to the highest standards in even the most pressurised situations.